Controversial O.A.P Daddy Freeze has hit us again with one of his many controversial forewarnings. Sharing a collaged photo of Bill Gates, Aliko Dangote and popular Nigerian clerics, Bishop David Oyedepo and Pastor Enoch Adeboye he adviced his followers not to listen to clerics if they want to be billionaires. 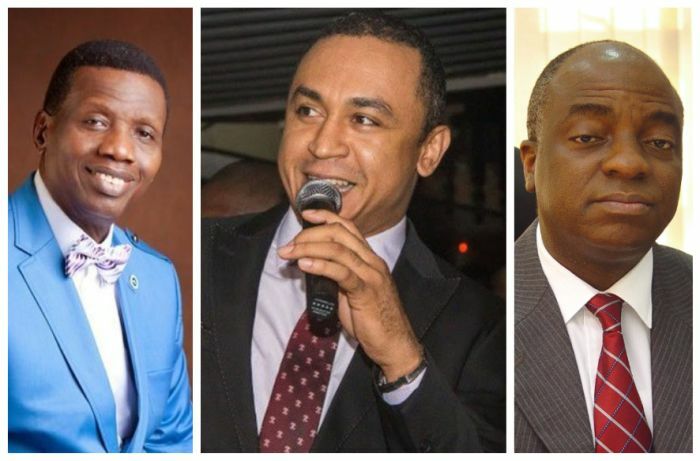 According to Daddy Freeze these clerics can’t lead you to heaven because they don’t know the way there. The leader of Free The Sheeple movement also told that Bill Gates and Dangote have 2000 heads and no one should be deceived by clerics who say they can be like these men because they have one head . Having said that, he noted that he can never be like Dangote because he does not have his unique entrepreneurial gift. If you want to end up like Dangote or Bill Gates, stop listening to the men pictured above. If the scriptures are anything to go by, teachers of religious law are hell bound, TITHING IS THE LAW! Another fallacy is the prosperity teaching that says: “You can be like Dangote, Dangote doesn’t have two heads”. DANGOTE AND BILL GATES HAVE 2,000 HEADS! They have a rare and unique talent that isn’t available to just any and everyone. Remember in all of Egypt ONLY Joseph could interpret pharaohs dream. Anyone who tells you that you can do business like Dangote is a LIAR, it’s like telling you that you can sing like Michael Jackson, understand Physics like Einstein or play football like Messi or Ronaldo. I CAN NEVER BE LIKE DNGOTE, because I don’t have his unique entrepreneurial gift. My unique gift is deep understanding of, and the ability to teach the SCRIPTURES, which I have shown with much dexterity, what is your gift? You want to play football like Messi? Welldonsir, find your gift today and harness it. “What sorrow awaits you teachers of religious law and you Pharisees. Hypocrites! For you cross land and sea to make one convert, and then you turn that person into twice the child of hellf you yourselves are!